I know, I know - about bloody time I do this post.. I've been working a lot, and yesterday I worked 17 hours straight. here are my favourites for this past month!! I love this bronzer, repurchased as soon as I hit pan, it's got the perfect golden undertone to it, highly buildable and really fool-proof. it's amazing for summer and matches my skintone really well. I still have to find time to review these pressed powders from ELF. and I got it in May [I believe], so this is really amazing!! I have never loved this product before, and I was always kind of "meh" about it. I even repurchased on the 50% off. I have been using this throughout the summer for filling in my brows, Love it. Adore it. This polishes my brows like a dream. eyeliners and I adore them. This is amazing!! I apply this as a highlight on my cheekbones and it blends the blush area like a dream, I apply it on my under eyes too and it really brightens up my eyes and with its golden/yellow undertone, it cancels my purple under eyes. I have been wearing this quite a lot this summer. It's a super uber gorgeous milky baby neon pink. I LOVE these. HG falsies. This is a gorgeous orange coral peachy shade. Have been wearing this almost every day. 13. ELF studio lip conditioners in nice and natural and mellow melon. Two amazing lipglosses. Yes, to me, this is the most perfect gloss texture. Amazing products. Have been wearing them A LOT during this month. Again, to me, this is a gloss, and it's a gorgeous peachy gloss. HG peach gloss. I think I'm gonna get me a backup. LOVE this in the crease area. It's so amazing, I get endless compliments when I'm wearing it. It's also great over a black base for a smokey eye. Wore it yesterday like that with some orange eyeshadow as a transition shade, and I love it. I hit pan on this baby. It's amazing as a base over your eye primer. Cancels any veins and what not. A gorgeous champagne, peachy kind of shade. and when I say gorgeous, mean, seriously gorgeous. and a gorgeous transition shade with smokey eyes. but will do as soon as I can. it makes a beautiful smokey eye, and I have a very visible dent in this eyeshadow pan. I have been loving this as a base on my inner eye area and browbone. 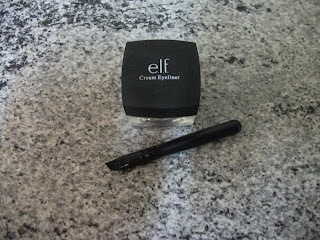 I have been loving this over NYX jumbo eye pencil in milk in my innercorner area. Thank you so much for reading and thank you for your endless support..
Nice faves. I need to start buying more drugstore stuff again, if only to review/compare/etc. ELF is amazing. please do answermy recent post. I love the nail polish color! I'm going to pick that up!! Great favs! Check out my blog & follow if you like. Hi :) You have a nice blog there, You have many nyx, elf products make me wanna buy these yaaaay! Please check out my blog im new to the world of blogging you might want to give me some suggestions or tips.